Jetwing Vil Uyana is situated among reed beds and paddy fields and over the first man-made lake since the era of Parakramabahu I. 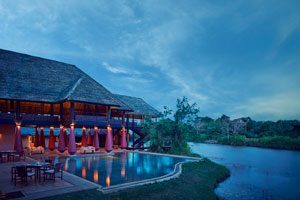 Situated in the shadow of the historic rock fortress of Sigiriya, is what Harper’s Bazaar calls the Best Eco Luxury Hotel in Sri Lanka. It was inspired by the habitat creation at the London Wetland Centre by the Wildfowl and Wetland Trust. The vast variety of biodiversity that have adopted the property as their own is truly spectacular. Spread over an expanse of 28 acres, the unique placement of dwellings and main buildings gives as much space as possible for nature to thrive. Along with the elusive Gray Slender Loris that has made grounds of Jetwing Vil Uyana its home, currently there are 36 species of butterflies, 120 species of birds, and 20 species of mammals. Choose from Garden, Marsh, Paddy, Water or Forest Dwellings to experience luxurious accommodation. Thirty-six spacious open structures have been built, each furnished sumptuously in both style and comfort to provide you with the modern amenities of the 21st century. 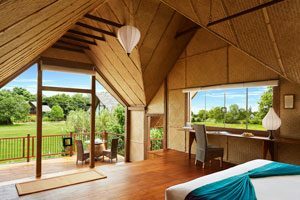 However, do not be deceived by the outward appearance of rural simplicity as the interiors of Jetwing Vil Uyana live up to the number of accolades awarded to the property. 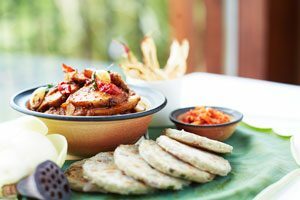 Choose from four different options at Jetwing Vil Uyana; Apsara offers fine-dining, light refreshments and refreshing drinks are yours to enjoy at Sulang along with a cool breeze and casual fare. Graffiti Bar is well stocked with an array of liquid treasures which will keep you in the best of spirits. Tree House Dining offers a novel dining experience with spectacular views of the surroundings. Perfect peace and absolute luxury awaits you at our spa which is built so as to be one with nature. Tension is swept away with a relaxing body massage while the soothing scents of aromatherapy care engulf you and rejuvenate you from top to bottom. You can have a soak in the plunge pool, and stay on and indulge in a candle-lit Spa dinner for two. Experience the bliss of sheer indulgence as you enter this private haven and your imagination becomes reality. Vil Uyana is an idyllic setting for small intimate gatherings which is why it has become a popular wedding destination. With everything organized down to the last dot couples can rest assured that there special day will take place without a hitch. Extensive menus with delicious cuisine, flowers, music and every possible requirement will be taken care of.